Who knew getting hurt could be so hip? One Louisville work injury law firm achieves star status. Winton & Hiestand Law Group enlisted A-list Rap Mogul and Founder of No Limit Records Master P to appear in their latest commercial. Obviously, this was an attempt to reach a younger, more hip audience. 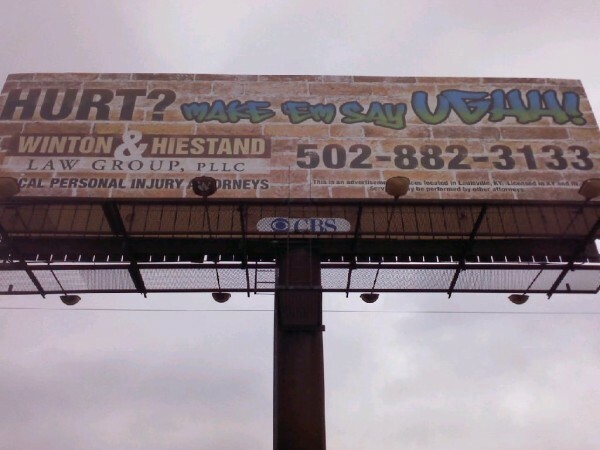 The commercial and accompanying billboard and advertisements use Master P’s famous catchphrase “Make ‘em say Ughh!” as the symbolic sound of frustration to be made by the party at fault for the injury, when they lose the case and owe Winton & Hiestand’s clients for costs caused by the injury. Credited to Winton & Hiestand. This well-known lyric and song title is from Master P’s sixth album Ghetto D, which was released in September 1997. Master P is well-known for his graphic gangster rap lyrics that propelled his success in the 90’s and early 2000’s. Even though, he just released his thirteenth album, “The Gift” last year, Master P says he’s most successful as a businessman. Master P’s, whose real name is Percy Robert Miller, 2013 net worth was over 350 million dollars, estimated by Forbes Magazine. Given that, it’s doubtful that he pitched this commercial for profit. According to TMC, the rapper became friends with the attorneys during the aftermath of Hurricane Katrina. Chauncey Hiestand said they got to know each other well when a lot of Miller’s friends moved from his hometown in Louisiana to Louisville, Kentucky. The attorneys’ YouTube post of the commercial states that Miller began to visit the area and got involved with the local community. He founded Let The Kids Grow Foundation to help struggling youth in Louisville. The organization provides educational and creative arts programs, as well as hot meals and backpacks to area students. Miller believes in education as a game-changer for these kids and encourages them to stay off the streets and in school. Winton & Hiestand said they worked with Miller on community projects. In return, Miller promoted their business, as a gesture of appreciation. Fulton & Barr may not have a celebrity spokesperson, but just like Winton & Hiestand they believe in helping those who truly need it. So, if you or anyone you know gets hurt on the job, contact Fulton & Barr, Attorneys at Law. They will work tirelessly to ‘rap’ up the case in your favor.